Nesting made easy; Why Milton have it sussed for Mum’s to be! There are so many things to think about as a new Mum and every time you think you’ve got it sussed and got everything ready for the arrival of your baby someone else pipes up with something you haven’t thought of. Honestly, the amount of times in the last month alone that I’ve sat and thought about how bad a Mum I’m going to be just because I haven’t thought of buying a baby thermometer or I haven’t bought any sleeping bags for her is just ridiculous (FYI I now have both). I think when it comes to having a baby for the first time you really do go in blind; no matter how many people tell you what to get, what not to get and try and force advice upon you, you really just don’t know what you’re going to need and what you’re going to be like as parents until it actually happens. This whole time I’ve thought I’m as prepared as I can be for our little girl making her appearance and until she’s here and crying through the night and needing her nappy changed, I don’t think I’ll ever actually be ready. One thing I definitely didn’t think of when it came to preparing myself for our baby was sterilising. Like, what the hell is sterilising when it comes to a baby?! Naïve little Beky over here literally didn’t have a clue. I think it was actually through Mrs Meldrum or Kate Murnane that I first realised sterilising ready for your baby was a thing. Obviously (kind of) I knew that when it came to having a baby everything had to be cleaned thoroughly and clothes had to be washed on a certain, more gentle setting with detergent that wasn’t going to aggravate her skin, but as far as actual sterilising was concerned for bottles and breast pumps and surfaces baby would be touching, I didn’t know the first thing. Milton has been a leading name in baby sterilising equipment at home for around 70 years now and as I’ve been well and truly settling into my ‘nesting’ period (the period where us new mamas just want to frantically clean and prepare everything), they’re the brand I’ve turned to for all of my baby preparing needs. 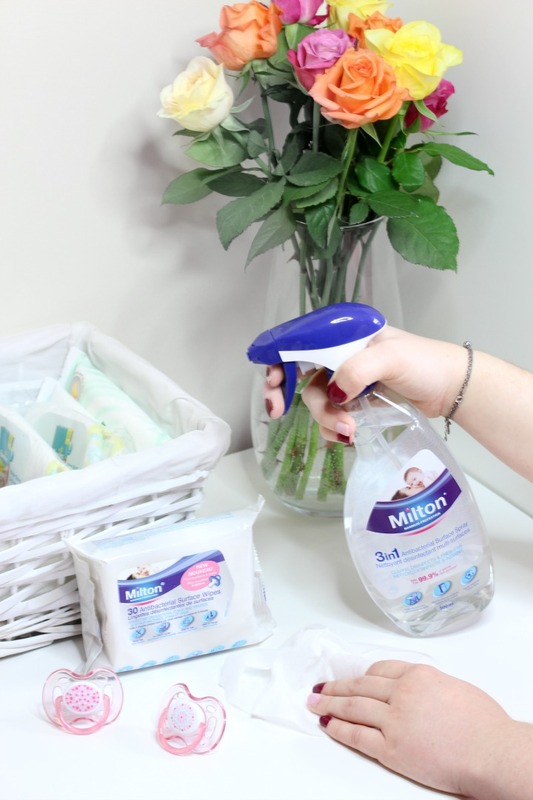 Trusted by Mums, Milton have got everything covered when it comes to hygiene for our little ones and ensuring that surfaces and feeding equipment are sterilised ready for use. When I first did a bit of research on how and what to sterilise I was quite amazed by how easy Milton have made it for us; something that sounds so daunting when you first hear about it and is so important to your baby’s health and immune system is definitely not as complicated as it seems at all. Obviously I haven’t had much experience with sterilising with a baby just yet as my baby girl still has a couple more weeks of cooking to do, but just by reading the Milton website and watching their step-by-step videos on how to properly sterilise your baby’s bottles and toys I already feel like I’m an expert and will be ready to go when it comes to sterilising everything for it’s first use. One set of products I have been using religiously as I get bubba’s room ready though have been from the Milton hygiene range. Their 3-in-1 Anti-bacterial Surface Spray and Anti-bacterial Surface Wipes have been all I’ve been using to ensure everything in her room is baby ready before the big day. 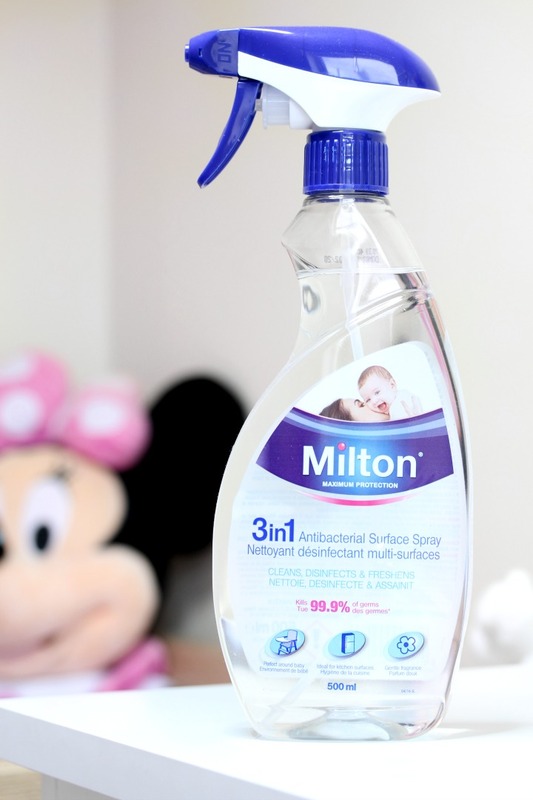 As part of the Milton family, the 3-in-1 Antibacterial Surface Spray still cleans, disinfects and freshens the surfaces it comes into contact with but without being full of the harsh chemicals that other cleaning sprays are. With it containing no bleach or alcohol, I feel really safe using this and have been using it on every surface available in her room and will be using it on every other surface I can think of when she finally arrives. I love how easy it is to just spray on and wipe over with a damp cloth and can definitely see this becoming a staple in our household for everyday cleaning when baby is here. Items like her bath support, high chair (when she’s old enough) and changing table can easily be cleaned with this with no extra fuss and I know it’ll leave everything safe for her to use straight away. The other product I’ve been loving lately and can honestly see me carrying around with me everywhere are the Antibacterial Surface Wipes from Milton. An easy compact pack of antibacterial wipes perfect for keeping everywhere for a quick clean up solution. Again these are bleach and alcohol free, so perfectly safe for baby and just like the surface spray, these kill up to 99.9% of germs. Easy and mess free with no need for water and a cloth, these wipes are going to be perfect for having in my changing bag to clean up any messes, for a quick clean of any toys or dummy’s or wiping over changing surfaces when we’re on the go. 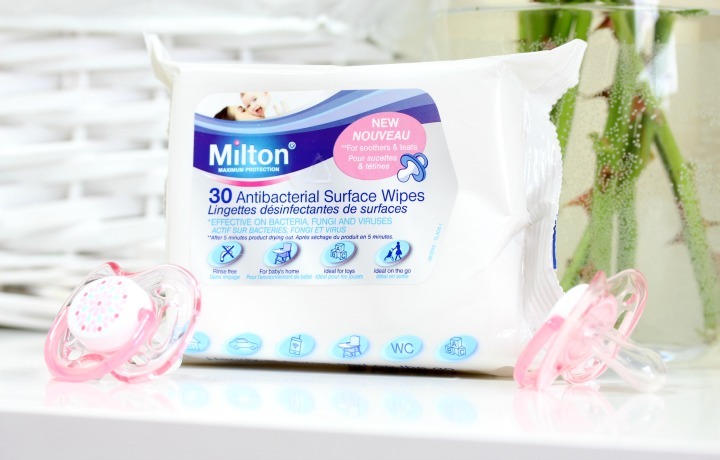 I don’t know about you, but the idea of changing my baby’s bare bum on one of those communal changing tables in public toilets has my skin crawling and so a pack of these Milton Antibacterial wipes are definitely going to be a must for carrying around with me. These are also going to be great for at home, having a pack next to our changing table will be a must and especially in the kitchen for a quick clean of the high chair before meals; they’re already so handy and I can see us buying pack after pack of these when bubba is here! Milton really do seem to have it sussed when it comes to cleaning and sterilising and as the day of our little girl arriving comes closer and closer (just under 4 weeks now) I’m finding myself reading more and more on the different methods and how-to’s for preparing everything for her. 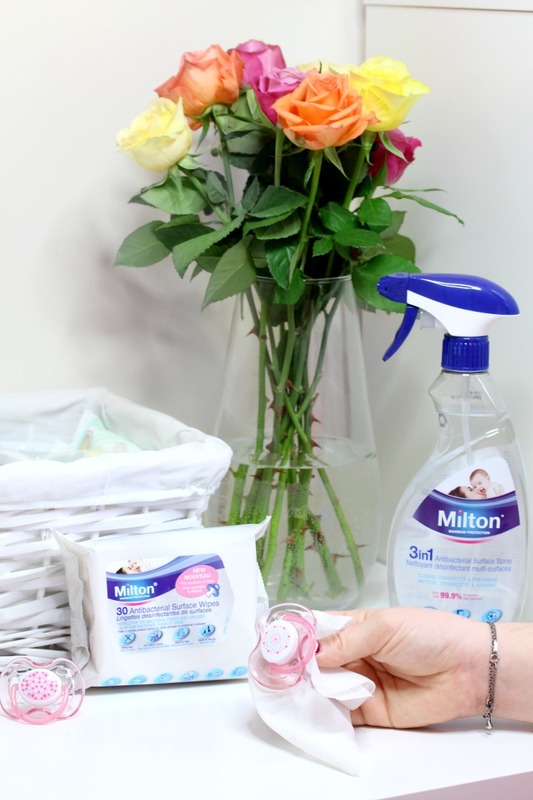 Milton products will 100% be replacing the usual surface wipes and sprays we use in our house to make sure we’re baby safe and not using chemicals that are too harsh for her skin. I can’t wait to get my hands on some of the sterilising products and getting all of her bottles etc ready for use over the next few weeks before she arrives! What are your baby sterilising tips and tricks? I’d love to get as much advice as I can in the comments from some of you mamas out there! This is not a paid for advertorial however I was kindly gifted the products to review. Previous Post Clarins SOS Face Masks Review; The best Clay Mask ever?! I use and love this sterllising spray, i've been using it since my son was born. I especially love the scent! Oh I'm so glad you love it too! The wipes are so handy already and bubba hasn't even arrived yet!